I was in the kitchen again today baking the larger-sized cookies that are sold at Dan’s Hamburgers and that the Best Western Plus Central Austin gives out to members of their loyalty club upon check in! These 1.9 ounce cookies are baked with 15 cookies on each sheet pan with four pans per oven. 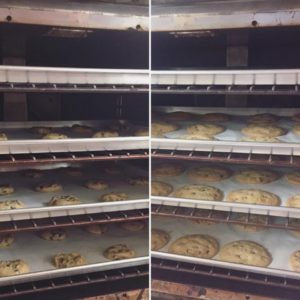 With two ovens, that’s a total of ten dozen cookies baking at the same time!